Coprinopsis cinerea is an excellent model for study of sexual reproduction and development in basidiomycetes because of its short-life cycle, capability to grow and fruit on artificial media under laboratory conditions. Deepening the understanding of genes underlying sexual reproduction and development in this mushroom model is expected to help in the future the world mushroom cultivation of any other basidiomycetes concerning the potential agronomic, economic and environmental benefits. This study presents findings with clear statements from the literature as well as own results focusing on the genetic analysis of genes acting in sexual reproduction and development in C. cinerea. Sexual reproduction and development in C. cinerea are regulated by the A and B mating type genes that encode two types of homeodomain transcription factors, pheromones and pheromone receptors, respectively. Coprinopsis cinerea has two different mycelial stages defined as the monokaryotic-(primary) and dikaryotic-(secondary) mycelium. When two compatible haploid monokaryons with different mating type alleles at A and B loci are fused, the fertile dikaryons are formed and developed into fruiting bodies, indicating that mating type genes regulate sexual development in C. cinerea. Self-fertile homokaryon AmutBmut strain with mutations in the A and B mating loci is ideal for production of mutants in fruiting body formation. Co-isogenic strains were generated by the repeated back-crossing against AmutBmut to analyze the genetic background of such mutants and the functions of genes in the fruiting pathway. Genetic analysis of AmutBmut fruiting mutants that are blocked at different stages in fruiting pathway will be described. P. Srivilai and P. Loutchanwoot, 2009. Coprinopsis cinerea as a Model Fungus to Evaluate Genes Underlying Sexual Development in Basidiomycetes. Pakistan Journal of Biological Sciences, 12: 821-835. Coprinopsis cinerea was formerly called Coprinus cinereus and identified as a species of Agaricaceae (Redhead et al., 2001) (Fig. 1). Recently, C. cinerea is classified as Psathyrellaceae. The name of C. cinereus has been changed to C. cinerea due to the recent phylogeny analysis with molecular markers (ITS sequences) by Redhead et al. (2001), but some current publications still use the name C. cinereus (Arima et al., 2004; Riquelme et al., 2005; Heneghan et al., 2007). The C. cinerea or ink cap mushroom is a unique organism amongst higher basidiomycetes with a dramatic morphological differentiation from vegetative mycelia into fertile fruiting bodies in which abundant numbers of basidiospores are formed (Kües and Liu, 2000; Casselton and Riquelme, 2004). Coprinopsis cinerea is an excellent model fungus extensively used to study particularly the fundamental biological processes such as metabolic, regulatory, reproduction and developmental pathways including fruiting body development and to investigate the genes underlying these processes and also evolution (Kües et al., 2004; Srivilai et al., 2005; James et al., 2006) because it is easily grown under the laboratory conditions utilizing artificial media (for example: yeast extract-malt extract-glucose; YMG/T medium supplemented with Tryptophan) as well as its original natural substrate horse dung (Srivilai et al., 2005; Liu et al., 2006). Most importantly, for an ideal experimental model C. cinerea has the ability to complete its life cycle within 2 weeks (Kües, 2000; Walser et al., 2001). The strain is accessible by both the classical and molecular genetics (Binninger et al., 1987; Granado et al., 1997; Walser et al., 2001; Srivilai et al., 2005). The complete genomic sequence of Coprinopsis cinerea has been released by the Broad Institute (www.broad.mit.edu/annotation/fungi/coprinus_cinereus/) (Srivilai et al., 2005; Liu et al., 2006). Various molecular biological techniques have so far been developed in C. cinerea such as gene transformation (Binninger et al., 1987; Liu et al., 2006), REMI [Restriction Enzyme-Mediated Integration of (DNA)], a technique for mutant production by DNA transformation (Granado et al., 1997; Liu et al., 1999) and gene mapping with any suitable molecular- and chromosomal markers (Zolan et al., 1994; Muraguchi et al., 2003), as well as the modern cytological techniques, such as the fluorescent in situ hybridization (FISH) (Li et al., 1999). Post-Transcriptional Gene-Silencing (PTGS) in C. cinerea was studied by expression of homologous hairpin RNAs (Martin et al., 2006) antisense and RNAi-mediating hairpin sequences (Heneghan et al., 2007). These reasons as discussed above make C. cinerea as an attractive model species to study the expression and action of genes involving in sexual reproduction and fruiting body developmental pathway in basidiomycetes. This study presents findings with clear statements from the study as well as own results relevant to this emerging issue. Life cycle of C. cinerea: Coprinopsis cinerea is a heterothallic basidiomycete, i.e., it has two different types of mycelia in the life cycle, namely the sterile primary mycelium, the monokaryon and the fertile secondary mycelium, the dikaryon (Fig. 2). The life cycle of C. cinerea begins with the germination of haploid basidiospores under appropriate environmental conditions. A single basidiospore germinates to a monokaryon which contains usually one individual haploid nucleus, defined mating type specificity per hyphal segment, or sometimes also two genetic identical haploid nuclei (Waters et al., 1975; Kües, 2000; Kües et al., 2002a). The monokaryon has simple septa and constitutively forms in high numbers the vegetative spores (oidia) in the specialized aerial mycelia (oidiophores) and in older age, in the large inflated single cells (chlamydospores) at the agar or agar-air interface (Polak et al., 1997; Kües et al., 1998). Furthermore, monokaryons may develop aerial and submerged sclerotia, which are multicellular structures that have a brown-coloured pigment in their outer cell layers (rind), on the old agar upon the depletion of nutrients and serve as the resting structures to overcome situations with adverse environmental conditions (Moore, 1981, 1998; Elhiti et al., 1987). For sexual reproduction and development, each monokaryon has to mate with another compatible monokaryon of different mating type to form a fertile dikaryon, which is characterized by a vigorous mycelium and the presence of two distinct haploid nuclei per hyphal cell and clamp cells at the hyphal septa (Fig. 3A, B) (Kües and Casselton, 1992; Badalyan et al., 2004). On the dikaryon under the defined conditions, dikaryons further develop into the mature fruiting bodies or mushrooms and sexual basidiospores occur in the specialized basidium in which karyogamy and meiosis occur that finally results in the formation of four basidiospores per basidium (Moore, 1998; Kües, 2000). Each basidiospores obtains one haploid nucleus from meiosis and there is the post-meiotic nuclear division in the spores. As the consequence, each basidiospore contains two identical haploid nuclei (Kües, 2000; Kües et al., 2004). As a subsidiary cycle, on both the monokaryon and dikaryon, C. cinerea can form the haploid unicellular asexual spores or oidia (Casselton, 1995; Kües, 2000). Fruiting body initiation and development in C. cinerea: The development of fruiting body is a highly organized process which regulated by both the genetic and environmental factors (Boulianne et al., 2000; Kües, 2000; Kües et al., 2004). Mating between two compatible C. cinerea monokaryons which have different allelic genes pairs of both mating type loci gives rise to a dikaryon, which has two distinct haploid nuclei per hyphal cell (Fig. 2). Clamp cells are usually formed at above of the hyphal septa, the position that closes to the branching of hyphal mycelium and serve in the correct distribution of the two types of parental nuclei in cell division (Casselton and Economou, 1985; Kües, 2000). On the dikaryon under fruiting conditions (temperature: 26-28°C, humidity: 80-90% and a reverse 12 h light/12 h dark cycle), hyphal knots develop by aggregation of the mycelia to initiate fruiting body development. The mycelial aggregation can be divided into two levels, i.e. the primary hyphal knot formed in the dark and secondary hyphal knot that requires light signal (Fig. 4). Primary hyphal knot is the first level of hyphal aggregation and forms by intense localized hyphal branching and packing of several short generative hyphae under dark condition. Upon light induction, some of the primary hyphal knots can aggregate with each other to form the fluffy spherical mycelial bodies called secondary hyphal knots, which have the size ranging from 1 to 2 mm and are specific fruiting initials (Fig. 5). With a light stimulus, the cells inside the secondary hyphal knot then differentiate to the multicellular tissues and eventually form the primordia. This developmental stage is believed to be the first stage of the fruiting body formation (Moore, 1981, 1998; Kües et al., 1998; Kües, 2000). Without light induction, the primary hyphal knots will develop into globose, small multicellular pigmented, persistent resting structures called sclerotia (Moore, 1981, 1998; Kües, 2000; Kües and Liu, 2000) (Fig. 4). As shown in Fig. 4, inside the small packing of many secondary hyphal knots, cellular differentiation occurs and leads to the formation of rudimentary tissues of the future pileus and stipe giving rise to the structure called primordium growing in size up to 1 cm (Fig. 5). The primordium gradually enlarges and then proceeds to the fruiting-body maturation phase under proper light conditions, such as the 12 h light/12 h dark cycle (Fig. 4, 6) (Moore, 1998; Kües, 2000). When primordia development is finished, within basidia the karyogamy and subsequently meiosis occur by a further light induction (Moore, 1998; Kües, 2000; Srivilai et al., 2005). With induction of karyogamy the primordia are transformed into the immature fruiting bodies, whilst the clusters of parallel-orientated hyphae that form the mushroom stipe elongate and the cells of apical prosenchymal tissue that form the pileus (young mushroom cap) inflate during the initiation of the maturation of fruiting body development (Fig. 6) (Muraguchi and Kamada, 1998; Kües, 2000). Light signaling is required for the initiation of fruiting body and cellular differentiation within the small packing of secondary hyphal knots. The development of immature fruiting body including the formation of stipe and cap tissues also requires the light signal (Kües et al., 1998, 2002a). While, the stipe elongates, the basidiospore pigmentation occurs and the hymential cells become vacuolated (Moore, 1998; Kües, 2000). The mature fruiting body usually has the height at around 20 to 100 mm (Fig. 6). The stipe elongates rapidly. The cap expands like an umbrella and opens during the midnight. The development of the primordia to the mature fruiting body comprises four major processes, i.e., basidiospore formation, stipe elongation, cap expansion and, after fruiting body maturation, the cap autolysis (Kües, 2000; Kamada, 2002). During basidiospore formation by a budding-type process on the basidia, each one haploid nucleus that arose by meiosis is migrating from the basidium into a spore. Subsequently, the mature fruiting body appears black by the colour of melanin incorporation into the spore cell wall of the ripe basidiospore. Basidiospore formation is finished when the cap is fully expanded. The fruiting body is short-lived. Only a few hours after, the cap autolysis occurs thereby releasing the spores (Moore, 1998; Kües, 2000; Walser et al., 2003; Kües et al., 2002a). The expression and functions of mating type genes in C. cinerea: In higher basidiomycetes, mating type specificity, formation and maintenance of the dikaryotic mycelium are controlled by the two multiallelic independent mating type loci, namely A and B (Fig. 7) (Casselton and Kües, 1994; Casselton and Olesnicky, 1998; Casselton and Challen, 2006). The A and B mating type genes have distinct roles in the cellular functions. Whilst, A mating type gene is unlinked to B mating gene, however, A and B genes are associated with the maintenance of the dikaryon after dikaryotization. On the dikaryons, A mating type genes of different specificity together regulate the paring of nuclei, initiation of clamp cell formation, synchronized nuclear division and septation. The different B mating type genes regulate the peg formation, clamp cell fusion and also control the nuclear migration (Casselton and Olesnicky, 1998; Kües, 2000; Kamada, 2002; Kües et al., 2002a; Badalyan et al., 2004). Furthermore, the different A and B mating type genes act in fruiting initiation and in maturation at the point of induction of karyogamy (Tymon et al., 1992; Kües et al., 1998, 2002b). In addition, number of studies utilizing the gene transformation revealed that functions of A and B genes in the host and only a homeodomain protein promotes the clamp cell formation (Pardo et al., 1996; Srivilai et al., 2005). The mating type pathway has so far been studied. The same A mating type gene specificity but different B mating type specificity is called common A heterokaryon. Genetic analysis suggested that the common A mating type pathway is Aoff Boff, i.e., the mycelial morphology shows 1 to 2 nuclei per hyphal segment and monokaryon-like. Common B heterokaryon is the one that has the different A mating type specificity but the same B mating type specificity (Amut homokaryon, Aon transformant). Such mating type pathway is Aon Boff and the mycelial morphology shows unfused clamp cells with the vigorous growth (Kües, 2000; Casselton and Challen, 2006). In monokaryon, the mating pathway of the common A heterokaryon, which has the same A mating type gene specificity but different B mating type gene specificity, is called Aoff Bon, i.e., Bmut homokaryon, Bon transformant. Of such strain, the mycelial morphology shows monokaryon-like hyphae with the retarded growth. The Aoff Bon is called semi-compatible strain (James et al., 2006). Dikaryon is a successful sexual process and the mating type pathway is called Aon Bon (AmutBmut, Aon Bon transformant). 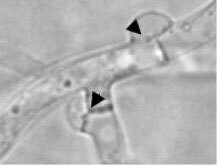 The mycelial morphology shows the fused clamp cells, 2 nuclei per hyphal segment and vigorous growth (Kües, 2000; Srivilai et al., 2005). Several lines of evidence demonstrated that the presence of compatible A mating type genes (Aon) possibly induce the production of chlamydospores, hyphal knots and sclerotia. 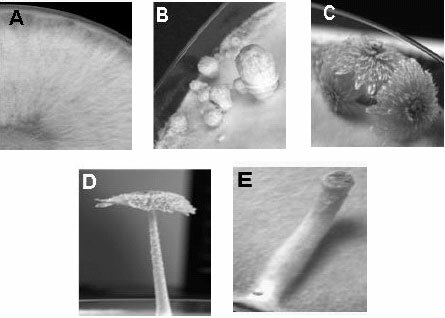 Hyphal knots of the Aon transformants further developed into fruiting body primordia, but they stopped to further develop at the developmental stage before karyogamy (Kües et al., 1998, 2002b). Only when A mating type genes and B mating type genes of different specificity were simultaneously transformed into a monokaryon, fruiting body development could be completed (Kües et al., 2002b; Casselton and Challen, 2006). These evidences revealed that the B mating type genes are needed for later stages of development. However, the compatible B mating type genes (Bon) do not completely induce the initial fruiting body, i.e., primordium. Mating type system and sexual development in C. cinerea: In the basidiomycetes, heterothallic species need to undergo mating between two compatible monokaryotic strains carrying two nuclei of opposite mating type for sexual reproduction and development (i.e., karyogamy and meiosis) to occur to produce basidiospores for the genetics maintenance and they have the mating-type system to control the mating between their species. Heterothallic mushrooms such as C. cinerea as well as Schizophyllum commune have both the A and B mating type genes, whereas some heterothallic mushrooms have only single A mating type gene such as Ustilago hordi, C. disseminatus and Pholiota nameko. The compatibility of the mating system is defined by the A and B mating type genes which encode distinct proteins. Each protein interacts with other compatible proteins that encode from the same genes paring of A and B mating type genes. Expression of mating type genes and formation of dimer-protein leads to the formation of clamp cell which is the signal of initiation of sexual development (Casselton and Kües, 1994; Casselton and Olesnicky, 1998; Casselton and Challen, 2006). Sexual development in heterothallic species is controlled by either one or two mating type loci. Species with one mating type locus are called bipolar, because two different mating type specificities segregate in the haploid progeny of a cross. These mating types correspond to the mating types of the parental strains of the cross. Species with two mating type loci are tetrapolar and four different mating types are found among the progeny of a cross. Two of the four mating types are parental by passing on parental alleles at both mating type loci. The two alternate mating types are newly formed by recombination between the two mating type loci. Approximately 30-40% of heterothallic species are estimated to be bipolar and 60-70% to be tetrapolar (Kües, 2000; Casselton and Riquelme, 2004). In most cases, the single mating type locus of bipolar species are called A, the two mating type loci of tetrapolar species A and B. Usually, mating type loci in the basidiomycetes are multi-allelic. Different mating type specificities are indicated by numbers (A1, A2, A3, B1, B2, B3). In species with two mating type loci, every distinct A and B combination defines a specific mating type, i.e., A1B1, A1B2, A2B1 and A2B2 strains are all different in mating behaviour. Of these, A1B1 and A2B2 strains are compatible as A1B2 and A2B1 strains. For a successful mating, fusing monokaryons need to be different at both mating type loci. In consequence, tetrapolar breeding systems promote outbreeding (Casselton and Kües, 1994; Kamada, 2002; Kües et al., 2002a). The A and the B mating type genes in tetrapolar species regulate different steps in sexual development explaining why both loci have to be different between two mates (Casselton and Olesnicky, 1998; Kües et al., 2002a, 2004; Casselton and Riquelme, 2004). Multiallelic mating type systems are also present in the other tetrapolar mushrooms such as S. commune and U. maydis. The A mating type locus of C. cinerea is homologous to the b mating type gene of U. maydis and A mating type gene of S. commune, whereas the B mating type locus of C. cinerea is homologous to the a mating type locus of U. maydis and the B mating type locus of S. commune (Kües, 2000). The chromosomal organization of the A mating type gene and other neighbouring genes of C. bilanatus is closely resembled to the chromosomal organization of the A mating type gene of C. disseminatus as well as C. cinerea (Kües et al., 1994, 2001). In C. cinerea, the A mating type locus is located on the first of the totally 13 chromosomes, adjacent to the Mitochondria Intermediate Peptidase (MIP) gene and the para-aminobenzoic acid synthase (pab1) and tryptrophan genes (trp1.1. and trp 1.1, 1.6) (Giasson et al., 1989; Mutasa et al., 1990; James et al., 2004). A co-segregation gene MIP linked to A mating type gene of C. cinerea and the other basidiomycetes strains, approximately 1 kb of the distance between A mating type gene and MIP gene (Kües et al., 2001; James et al., 2004). The A mating type locus is composed of two subloci, namely the Aα- and the Aβ sublocus, both of which have multiple alleles (Fig. 8) (Kües et al., 1994). The Aα locus contains either an a1 allele or an a2 allele, or alleles of both genes which together are called the A mating type gene pair. The a1 gene encodes a homeodomain transcription factor 1 (HD1) protein and the a2 encodes a homeodomain transcription factor 2 (HD2) protein (Fig. 8) (Kües et al., 1994; Hiscock and Kües, 1999; Casselton and Challen, 2006). HD1 and HD2 proteins refer to distinct homeodomain sequences (specific DNA binding domains) within the encoded transcription factors. The Aβ locus contains three different gene pairs, i.e., b1 and b2, c2 and c1 and d1 and d2, which encode two different type of HD proteins (Kües et al., 1994; Pardo et al., 1996; Hiscock and Kües, 1999; Kües, 2000). The type of HD proteins correlates with the number of allelic type, for example, b1 and HD1, b2 and HD2, respectively. Generally, to induce sexual development, at least one HD1 and one HD2 protein from different parental original have to interact to give an active transcription factor complex (Fig. 8). It is further important to note that only proteins from allelic gene pairs interact but not proteins from different gene pairs or proteins from a same gene pair. Several studies utilizing DNA transformation revealed that only a single compatible HD1-HD2 heterodimer from A mating type genes is needed to trigger, for example, clamp cell formation (Casselton and Kües, 1994; Pardo et al., 1996; Kües et al., 2002b). Furthermore, recent studies demonstrated that the active heterodimers from A mating type genes of different parental origin suppress oidia production on the aerial mycelium on the dikaryon under dark condition (Kertesz-Chaloupková et al., 1998; Kües et al., 2002b; Srivilai et al., 2009). In C. cinerea, there are at least three independently interacting HD1-HD2 gene pairs. Each gene pair has a few alleles that are freely recombining with the alleles from the other gene pairs. This recombination generates the estimated number of 160 different A mating type specificities. For sexual development, it is, however, enough if mates carry different alleles at any one of the three possible HD1-HD2 gene pairs (Casselton and Olesnicki, 1998; Casselton and Challen, 2006). In basidiomycetes, the B mating type locus is not linked to the A mating type locus, indicating that the B mating type genes are independently segregated during meiotic division. In C. cinerea, the B mating type locus is located on the second chromosome or tenth chromosome, depending on which of available gene maps it is referred to, either the classical map established, or the molecular marker map established by Muraguchi et al. (2003). The B mating type locus has three independent gene subfamilies which are called sub-family 1, sub-family 2 and sub-family 3 (Fig. 9). Each subfamily consists of one gene encoding a pheromone receptor (rcb1, rcb2 and rcb3, respectively) and two genes encoding pheromones (phb1-1 and phb1-2, phb2-1 and phb2-2 and phb3-1 and phb3-2, respectively) (Fig. 9) (O'Shea et al., 1998; Halsall et al., 2000; Kües, 2000; Riquelme et al., 2005). Based on transformation studies, it was concluded that for induction of sexual reproduction a pheromone receptor has to interact with pheromones that come from an allelic subfamily of genes from a nucleus of a compatible mating type. In C. cinerea, three independent groups of genes, each comprising one pheromone receptor gene and up to three pheromone genes, have been revealed. Different combinations of the various alleles of these groups are expected to give rise to the 80 B specificities estimated to exist in nature (O'Shea et al., 1998; Halsall et al., 2000). Mutations and essential genes in sexual development in C. cinerea: Basically, C. cinerea develops from the vegetative dikaryotic mycelium to the mature fruiting body within 1 week under appropriate environmental conditions. However, some dikaryons stop development already at initiation of fruiting body formation, i.e., at the stage of mycelial aggregation, or within primordial formation due to defects in various gene functions. From study of other researchers it was known that in nature defects of various genes occur within the natural populations of C. cinerea strains that do not or only suboptimal function in fruiting body development (Moore, 1981, 1998). Within the C. cinerea dikaryons, recessive genes are only expressed in the phenotypes when present in the homozygous state. According to several evidences that were given by Takemaru and Kamada (1972) and Moore (1981), there are many unknown recessive genes present in nature that are silent in heterozygous dikaryons of C. cinerea and these reside within the natural gene pool of the species. In contrast, dominant mutations are rarely found in nature (Muraguchi and Kamada, 2000). Selection for sexual reproduction disfavors their maintenance in the gene pool, unless it is a mutation that affects just the shape of the mushroom (Muraguchi and Kamada, 2000), or it is a mutation that allows fruiting already on the monokaryon. The fisc mutation isolated in the year 1971, for example, is such a mutation of the later case (Uno and Ishikawa, 1971) and also the CopD5 mutation isolated in the year 1998 (Murata et al., 1998a, b; Muraguchi et al., 1999; Muraguchi and Kamada, 2000). Sequencing demonstrated that in these two mutants the same gene was affected, pcc1 (pseudoclamp connection formation), which is distinct from the A and B mating type genes and encodes a potential transcription factor (Murata et al., 1998a, b). Such monokaryotic fruiting mutants exhibited pseudoclamps or no clamp connection obviously occur in certain frequencies within nature. They nevertheless have disadvantages compared to the dikaryons, for example, in the frequencies of initiation of fruiting body development and in the correct formation of mushrooms with well structured caps and stipes (Murata et al., 1998a). This is likely also due to suboptimal genes in later stages of fruiting. Moore (1981) deduced subsequently from genetic crosses of natural monokaryotic strains that there are many recessive genetic defects in fruiting body development present within the natural gene pool of C. cinerea. Quite unintended, the genome sequencing project has thus uncovered a new mutation in fruiting in C. cinerea. Moreover, sometime spontaneous mutations occur in crosses of C. cinerea. UFO1 is such a spontaneous mutant which is characterized by a short stipe (Srivilai et al., 2005) (Fig. 10). Interestingly, mutant UFO1 also carries a defect in a basidiospore formation gene (bad or spo) that came from the parental monokaryon 218 (Pukkila, 1993, 1996). Strain UFO1 is thus an example that a single strain can accumulate several different natural mutations in the fruiting pathway (Srivilai et al., 2005). Till date, very few genes of fruiting body development of C. cinerea have been studied by gene cloning for analysing the respective functions. As a first gene, the pileus-specific ich1 (ichijiku1) gene was cloned by first identifying the chromosome it locates on and then complementing the spontaneous recessive ich1 mutation through transformation of a chromosome-specific library into an ich1 defective monokaryon followed by crosses of transformants to another compatible ich1 strain (Muraguchi and Kamada, 1998). It was found that a recessive mutation of the ich1 gene in C. cinerea give rise to the mutants which show defect in the differentiation of cap cells during the fruiting body formation (Muraguchi and Kamada, 1998). Lack of pileus tissue causes a dent in the normally egg-shaped primordia giving the structure a fig-like shape. The abnormal ich1 primordia rupture during stipe maturation and basidiospores are not formed, unless the defect is complemented by transformation with the wild-type gene. Ich1 is a large protein of 1,353 amino acid residues that contains a potential nuclear targeting signal and has therefore been suggested to act within the nucleus (Muraguchi and Kamada, 1998). Moreover, the protein has in its N-terminal half a potential S-Adenosyl-Methionine (SAM) binding domain similar to known O-methyltransferases (Kües, 2000). Dominant genes might be obtained in analogous strategies but by transformation into a wild-type monokaryon prior to mating of transformants to a compatible wild-type strain (Muraguchi and Kamada, 1998). These data demonstrated that in C. cinerea the ich1 protein is essential for pileus formation, which is essential for sexual development and reproduction because the pileus bears the hymenium that includes basidia in which karyogamy, meiosis and sporulation occur (Muraguchi and Kamada, 1998; Muraguchi et al., 1999). The eln2 (elongationless2) gene is a constitutively expressed gene that encodes a novel type of a microsomal cytochrome P450 enzyme, termed CYP502. A dominant eln2 mutation (originally identified in a self-compatible background) affects stipe tissue formation in the primordia and the defect results in dumpy fruiting bodies with short stipes. The mutant gene was found by altered phenotype on the dikaryon after transforming a wild-type monokaryon and crossing to another strain (Muraguchi and Kamada, 2000). By transformation with a plasmid carrying a wild type eln3 gene, Arima et al. (2004) could rescue the wild-type phenotype in the eln3-1 mutant which prior to transformation was characterized by a defect in the stipe elongation during fruiting body maturation (Arima et al., 2004). It was therefore concluded that transcription of the eln2 and eln3 genes are specifically activated in rapidly elongating stipe in fruiting body maturation of C. cinerea. In addition, Boulianne et al. (2000) showed that distinct fruiting developmental processes correlate with the specific expression of two fungal galectins, cgl1 and cgl2, which are differentially regulated during fruiting body formation and specific to the level of mycelial aggregation. The homokaryon AmutBmut has both primary and secondary hyphal knots (Srivilai et al., 2005; Liu et al., 2006). While cgl2 expression is coordinated with hyphal-knot development, cgl1 is specifically expressed during fruiting body formation. The Cgl protein can now be used as a marker to study the process of development in Coprinus (Coprinopsis) at the molecular level. Anyhow, the most interesting mutants in C. cinerea are those that are defective in their mating type genes, with the consequence that fruiting body development occurs without mating to another strain (Swamy et al., 1984; Liu et al., 2006). The self-compatible C. cinerea homokaryon AmutBmut strain: Coprinopsis cinerea mutant strains with defects in both the A and B mating type loci are self-compatible that consequently can form the fruiting bodies with basidiospores without prior mating to another strain. Such mutant strains are called homokaryon AmutBmut and have a simplified life-cycle (Swamy et al., 1984; Boulianne et al., 2000; Liu et al., 2006) (Fig. 3). In such the homokaryotic AmutBmut strain, the basidiospores germinate into the self-compatible vigorous mycelia of dikaryon-like appearance (Kües, 2000; Srivilai et al., 2005, 2009). In addition, the mycelium of AmutBmut homokaryons has clamp cells at most hyphal septa that in certain instances fuse to the subapical cells, but only one type of haploid nuclei in its hyphal cells. In submerged medium, there are mostly two nuclei per hyphal cell and in there aerial mycelium, there is often only one nucleus in a hyphal cell (Swamy et al., 1984; Polak et al., 1997). Strain AmutBmut is therefore not referred to as monokaryon but it is called dikaryon-like homokaryon (Swamy et al., 1984). Having this homokaryon AmutBmut allowed to find and understood more recessive mutant genes in C. cinerea. Mutants of the self-compatible homokaryon AmutBmut are easy to generate by using either the classical mutation methods such as UV-treatment, or by modern REMI (Restriction Enzyme-Mediated Integration) mutagenesis via DNA transformation. Large collections of mutants homokaryon Amut Bmut were produced (Granado et al., 1997; Muraguchi et al., 1999; Cummings et al., 1999; Srivilai et al., 2005) that can be used for studying individual steps in fruiting body development. As an example, the mutant 6-031, obtained from homokaryon AmutBmut by UV-mutageneis, was suspected to contain several mutated genes in the fruiting process induced by the UV-treatment (Fig. 10). In the past, genetic analysis of these mutants turned out to be difficult to perform due to the lack of co-isogenic compatible monokaryons (Liu et al., 1999). Recently, co-isogenic strains of different wild type mating type specificities have been constructed by repetitive backcrosses against the self-compatible homokaryons AmutBmut and therefore, served to find out dominant but also recessive mutations in the C. cinerea fruiting body development (Srivilai et al., 2005; Liu et al., 2006). Nowadays, AmutBmut homokaryons [either the original homokaryon AmutBmut from Swamy et al. (1984) or A43mutB43mut homokaryon 326 created by Pukkila (1996) from homokaryon AmutBmut through repeated backcrosses to monokaryon 218] are in most instances used in mutant production (Granado et al., 1997; Cummings et al., 1999; Inada et al., 2001; Arima et al., 2004). Several genes have been cloned from the UV and REMI mutants of such self-compatible homokaryons (Celerin et al., 2000; Inada et al., 2001; Arima et al., 2004; Liu et al., 2006). Among cloned functions acting in mushroom formation is a gene cfs1 for a cyclopropane fatty acid synthase (Liu et al., 2006) and a gene eln3 for putative membrane protein with a general glycosyltransferase domain (Arima et al., 2004). Alternatively to AmutBmut homokaryons, self-compatible strains with defects in the mating type pathways downstream of the mating type genes might be used for mutant production and gene recovery, e.g., the CopD5 mutant being defective in a gene pcc1 for an HMG box transcription factor acting in the A mating type pathway (Murata et al., 1998a, b; Muraguchi et al., 1999; Muraguchi and Kamada, 2000). The dominant eln2 gene is an example of a gene detected through mutagenesis of homokaryon CopD5 (Muraguchi and Kamada, 2000). A mutation in the C. cinerea cfs1 gene encoding a potential Cyclopropane Fatty Acid Synthases (CFAs) that is highly similar to bacterial cyclopropane fatty acid synthases affects the transition of the primary hyphal knots to the secondary hyphal knots. Also this gene was found by mutant complementation (Srivilai et al., 2005; Liu et al., 2006). Early stages of fruiting body development include the dark-dependent formation of primary hyphal knots and their light-induced transition to the more compact secondary hyphal knots (Kües, 2000; Kües et al., 2004). The AmutBmut UV mutant 6-031 forms primary hyphal knots, but development arrests at the transition state by a recessive defect in the cfs1 gene, isolated from a cosmid library by mutant complementation (Fig. 10) (Srivilai et al., 2005; Liu et al., 2006). Liu et al. (2006) therefore, concluded that as in bacteria, the physical properties of cellular membranes may alter through production of CFAs by Cfs1 and this could be the trigger to initiate fruiting body development in the basidiomycetes. Recently, at least two genes have been known to function in the initial sexual development in C. cinerea, i.e., pcc1 and clampless1 (clp1) genes which function to block the clamp cell formation in homokaryon AmutBmut (Murata et al., 1998a; Inada et al., 2001). They are unlike the mating type genes which have so far been known. The pcc1 is a recessive gene that can induce the fruiting body development without mating (Murata et al., 1998a) and is identical to the mating type genes of the ascomycetes such as FPR1 of Podospora anserina (45%), mat-Mc of Schizosaccharomyces pombe (43%) and mta-1 of Neurospora crassa (42%). In addition, pcc1 gene also has a putative nuclear localization signal, suggesting that Pcc1 protein functions as a transcription factor leading to the formation of clamp cell in the homokaryons (Murata et al., 1998a; Kamada, 2002). It was believed that Clp1 may mediate the releasing of the Pcc1 repression via the heterodimer. The clp1 normally expresses in the hyphae where the heterodimer proteins (HD1xHD2) are present and induces the clamp cell formation without the need of the A mating type gene combination. Clp1 is not shown any transcription initiation in the Pcc1 mutants (Murata et al., 1998a; Kamada, 2002). The mutant collection derived from the C. cinerea homokaryon AmutBmut: Crosses of the mutants to unrelated monokaryons demonstrated that there are multiple mutant strains derived from C. cinerea homokaryon AmutBmut that are blocked at different stages in the fruiting body development (Granado et al., 1997; Kües, 2000; Srivilai et al., 2005; Liu et al., 2006) (Fig. 4, 10). The names of groups of defective genes are shown in Fig. 4. The groups of these mutants have been categorized based on the phenotypes of the fruiting body produced and classified as following. Group I: The mutant strains developed without the formation of primary hyphal knots are known as primary knotless due to the defect in the aggregation of the mycelium and the mutation of the primary hyphal knot formation (pkn) gene. The C. cinerea strain Protro159 which was generated from the protoplasts of oidia of the homokaryon AmutBmut strain is such a strain that contains this pkn mutation (Kanda et al., 1989a; Granado et al., 1997; Kües, 2000). Group II: The mutants which show the defect in the transition of the primary hyphal knots to the secondary hyphal knots are called skn (secondary knotless) mutants due to the defect in the secondary hyphal knot formation (skn) gene, or cyclopropane fatty acid synthase (cfs1) gene (Fig. 10A). Recently, Liu et al. (2006) have isolated a gene that complemented the defect of fruiting body initiation in the skn1 UV-mutant 6-031 and found that the predicted gene product is highly homologous to cyclopropane fatty acid synthases, a class of enzymes characterized before in bacteria and recently also in the plant. Group III: The mutant strains that their hyphal knots cannot be developed to the primordium are known as primordiumless due to the mutation of the primordium maturation (prm) gene. Group IV: The mutant strains that cannot form the mature fruiting body are called mat (maturationless) mutants due to the mutation of the fruiting body maturation (mat) gene (Fig. 10B) (Srivilai et al., 2005). Group V: The mutant strains that have the defects in the elongation of stipe, i.e., very short stipe, are known as eln (elongationless) mutants due to the mutation of the stipe elongation (eln) gene (Fig. 10C) (Takemura and Kamada, 1972; Muraguchi and Kamada, 2000; Arima et al., 2004). Group VI: The mutant strains that are defective in both mushroom cap (pileus) expansion and autolysis are called exp (expansionless) mutants due to recessive mutations in the cap expansion (exp) gene (Kanda and Ishikawa, 1986; Kües, 2000; Muraguchi et al., 2008). It has been recently demonstrated that the exp1 gene transcription is strongly induced in the pileus 3 h before the start of pileus expansion for efficient dispersal of the spores. Due to the fact that the exp1 mutations cause a specific developmental phenotype, together with the fact that the transcription of exp1 is regulated developmentally, it was suggested that exp1 is a novel, transcriptional regulator controlling the final phase of fruiting-body morphogenesis (Muraguchi et al., 2008). Group VII: The mutant strains with the defect in the black-colored basidiospore formation have white caps are known as bad or spo (sporeless) mutants due to the mutation of the basidiospore formation (bad or spo) gene (Fig. 10D) (Kanda et al., 1989b; Binninger et al., 1987; Pukkila, 1993; Srivilai et al., 2005). Group VIII: The mutant strains with the defect in the functions of dark stipe (dst) gene is called dst mutant, which produce the dark-stipe structure even if the light conditions that usually promote the development of primordia into mature fruiting bodies in C. cinerea wild-type strains are given (Fig. 10E) (Srivilai et al., 2005; Terashima et al., 2005; Martin et al., 2006). Because the dark stipe is the figure that the primordium forms when left in the dark, it seems that the mutant is defective in perception of light. Several lines of study demonstrated that dst1, the gene responsible for the mutation, encodes a putative protein (Dst1) containing a LOV domain, which has strong similarities to those of the known blue-light receptors in the ascomycete Neurospora crassa and also in plants, suggesting that Dst1 is also a blue-light receptor of C. cinerea (Terashima et al., 2005; Sano et al., 2007), which currently have found to exert a pivotal function to regulate the asexual sporulation as well (Srivilai et al., 2009). Therefore, the dst mutant strain is an example that a single strain possesses a gene responsible for control of both the genetic and environmental factors, i.e., blue light stimulus, underlying the fruiting pathway (Srivilai et al., 2009). Mating type genes in the basidiomycetes regulate mating of monokaryons with other compatible strains as well as clamp cell formation on the dikaryon and fruiting body development. Tetrapolar species such as C. cinerea has two distinct mating type loci called A and B that together determine the specific mating type of a monokaryon. The self-compatible homokaryon AmutBmut strain with mutations in both mating type loci shows growth characteristics typical to the dikaryon, i.e., formation of fused clamp cells at the hyphal septa and also gives rise to fruiting bodies without prior mating to another strain. This special feature together with the ability to form oidia provides an easy accessible genetic system for analysis of genes acting in the fruiting pathway. Till date multiple mutants, that were blocked at different stages in fruiting body development, have been identified and divided into at least 8 major groups and named as the names of defective genes implied. Several investigated genes are essential for fruiting body initiation and development in C. cinerea, such as primary hyphal knot formation (pkn), secondary hyphal knot formation gene 1 (skn1) or cyclopropane fatty acid synthase gene 1 (cfs1), primordium maturation (prm), fruiting body maturation (mat), stipe elongation (eln), cap expansion (exp), basidiospore formation (bad) or sporulation (spo) and dark stipe (dst) genes. In addition, pcc1 (pseudoclamp connection formation) and clp1 (clampless1) genes have also been recently known to function in the initial sexual development and to prevent the clamp cell formation in the homokaryon AmutBmut. Grateful thank is conveyed to Professor Dr. Ursular Kües at Faculty of Forestry, University of Goettingen, Germany, for providing me molecular and classical genetic applications of the basidiomycete mushroom Coprinopsis cinerea. Arima, T., M. Yamamoto, A. Hirata, S. Kawano and T. Kamada, 2004. The eln3 gene involved in fruiting body morphogenesis of Coprinus cinereus encodes a putative membrane protein with a general glycosyltransferase domain. Fungal Genet. Biol., 41: 805-812. Badalyan, S.M., E. Polak, M. Aebi and U. Kues, 2004. Role of peg formation in clamp cell fusion of homobasidiomycete fungi. J. Basic Microbiol., 44: 167-177. Binninger, D.M., C. Skrzynia, P.J. Pukkila and L.A. Casselton, 1987. DNA-mediated transformation of the basidiomycete Coprinus cinereus. EMBO J., 6: 835-840. Boulianne, R.P., Y. Liu, M. Aebi, B.C. Lu and U. Kues, 2000. Fruiting body development in Coprinus cinereus: Regulated expression of two galectins secreted by a non-classical pathway. Microbiology, 146: 1841-1853. Casselton, L.A. and A. Econoumou, 1985. Dikaryon Formation. In: Developmental Biology of Higher Fungi, Moore, D., L.A. Casselton, D.A. Wood and J.C. Frankland (Eds.). Cambridge University Press, Cambridge, UK., ISBN: 0521301610, pp: 213-229. Casselton, L.A. and M. Riquelme, 2004. The Genetics of Coprinus cinereus. In: The Mycota: Genetics and Biotechnology, K�ck, U. (Ed.). Vol. II, 2nd Edn., Springer-Verlag, Berlin Heidelberg, Germany, ISBN: 3-540-42770-8, pp: 37-52. Casselton, L.A. and M.P. Challen, 2006. The Mating Type-Genes of the Basidiomycetes. In: The Mycota. Growth, differentiation and sexuality, K�es, U. and R. Fischer (Eds.). Vol. I, 2nd Edn., Springer Berlin Heidelberg, Germany, pp: 357-374. Casselton, L.A. and N.S. Olesnicky, 1998. Molecular genetics of mating recognition in basidiomycete fungi. Microbiol. Mol. Biol. Rev., 62: 55-70. Casselton, L.A. and U. Kues, 1994. Mating-Type Genes in Homobasidiomycetes. In: The Mycota. Growth, Differentiation and Sexuality, Wessels, J.G.H. and F. Meinhardt (Eds.). Vol. I, 1st Edn., Springer-Verlag , Berlin, Germany, pp: 307-322. Casselton, L.A., 1995. Genetics of Coprinus. In: The Mycota: Genetics and Biotechnology, K�ck, U. (Ed.). Vol. II, 1st Edn., Springer-Verlag, Berlin Heidelberg, Germany, ISBN: 3-540-58003-4, pp: 35-48. Celerin, M., S.T. Merino, J.E. Stone, A.M. Menzie and M.E. Zolan, 2000. Multiple roles of Spo11 in meiotic chromosome behavior. EMBO J., 19: 2739-2750. Cummings, W.J., M. Celerin, J. Crodian, L.K. Brunick and M.E. Zolan, 1999. Insertional mutagenesis in Coprinus cinereus: Use of a dominant selectable marker to generate tagged, sporulation-defective mutants. Curr. Genet., 36: 371-382. Elhiti, M.M.Y., D. Moore and R.D. Butler, 1987. 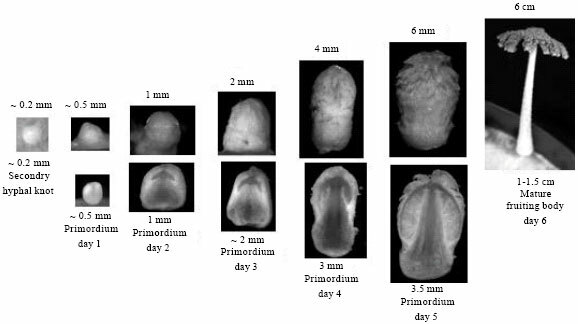 Ultrastructural distribution of glutamate dehydrogenases during fruit body development in Coprinus cinereus. New Phytol., 107: 531-539. Giasson, L., C.A. Specht, C. Milgrim, C.P. Novotny and R.C. Ullrich, 1989. Cloning and comparision of Aa mating-type alleles of the basidiomycte Schizophyllum commune. Mol. Gen. Genet., 218: 72-77. Granado, J.D., K. Kertesz-Chaloupkova, M. Aebi and U. Kues, 1997. Restriction enzyme-mediated DNA integration in Coprinus cinereus. Mol. Gen. Genet., 256: 28-36. Halsall, J.R., M.J. Milner and L.A. Casselton, 2000. Three subfamilies of pheromone and receptor genes generate multiple B mating specificities in the mushroom Coprinus cinereus. Genetics, 154: 1115-1123. Heneghan, M.N., A.M. Cost, M.P. Challen, P.R. Mills, A. Bailey and G.D. Foster, 2007. A comparison of methods for successful triggering of gene silencing in Coprinus cinereus. Mol. Biotechnol., 35: 283-296. Hiscock, S.J. and U. Kues, 1999. Cellular and molecular mechanisms of sexual incompatibility in plants and fungi. Int. Rev. Cytolrol, 193: 165-295. Inada, K., Y. Morimoto, T. Arima, Y. Murata and T. Kamada, 2001. The clp1 gene of the mushroom Coprinus cinereus is essential for A-reglulated sexual development. Genetics, 157: 133-140. James, T.Y., P. Srivilai, U. Kues and R. Vilgalys, 2006. Evolution of the bipolar mating system of the mushroom Coprinellus disseminatus from its tetrapolar ancestors involves loss of mating-type-specific pheromone receptor function. Genetics, 172: 1877-1891. James, T.Y., U. Kues, S.A. Rehner and R. Vilgalys, 2004. Evolution of the gene encoding mitochondrial intermediate peptidase and its cosegregation with the A mating-type locus of mushroom fungi. Fungal Genet. Biol., 41: 381-390. Kamada, T., 2002. Molecular genetics of sexual development in the mushroom Coprinus cinereus. Bioessays, 24: 449-459. Kanda, T. and T. Ishikawa, 1986. Isolation of recessive developmental mutants in Coprinus cinereus. J. Gen. Applied Microbiol., 32: 541-543. Kanda, T., A. Goto, K. Sawa, H. Arakawa, Y. Yasuda and T. Takemaru, 1989. Isolation and characterization of recessive sporeless mutants in the basidiomycete Coprinus cinereus. Mol. Gen. Genet., 216: 526-529. Kanda, T., H. Ishihara and T. Takemaru, 1989. Genetic analysis of recessive primordiumless mutants in the basidiomycete Coprinus cinereus. Bot. Mag. Tokyo, 102: 561-564. Kertesz-Chaloupkova, K., P.J. Walser, J.D. Granado, M. Aebi and U. Kues, 1998. Blue light overrides repression of asexual sporulation by mating type genes in the basidiomycete Coprinus cinereus. Fungal Genet. Biol., 23: 95-109. Kues, U. and L.A. Casselton, 1992. Homeodomains and regulation of sexual development in basidiomycetes. Trends Genet., 8: 154-155. Kues, U. and Y. Liu, 2000. Fruiting body production in basidiomycetes. Applied Microbiol. Biotechnol., 54: 141-152. Kues, U., 2000. Life history and developmental processes in the basidiomycete Coprinus cinereus. Microbiol. Mol. Biol. Rev., 64: 316-353. Kues, U., 1995. Evolution of A factor specificity genes in Coprinus cinereus. Fungal Genet. Newsl., 42A: 67-67. Kues, U., A.M. Tymon, W.V. Richardson, G. May, P.T. Gieser and L.A. Casselton, 1994. A mating-type factors of Coprinus cinereus have variable numbers of specificity genes encoding two classes of homeodomain proteins. Mol. Gen. Genet., 245: 45-52. Kues, U., E. Polak, A.P.F. Bottoli, M. Hollenstein and P.J. Walser et al., 2002. Vegetative Development in Coprinus cinereus. In: Molecular Biology of Fungal Development, Osiewacz, H.D. (Ed.). Marcel Dekker, New York, ISBN: 0-8247-0744-3, pp: 133-163. Kues, U., J.D. Granado, R. Hermann, R.P. Boulianne, K. Kertesz-Chaloupkova and M. Aebi, 1998. The A mating type and blue light regulate all known differentiation processes in the basidiomycete Coprinus cinereus. Mol. Gen. Genet., 260: 81-91. Kues, U., M. Kunzler, A.P.F. Bottoli, P.J. Walser and J.D. Granado et al., 2004. Mushroom Development in Higher Basidiomycetes: Implications for Human and Animal Health. In: Fungi in Human and Animal Health, Kushwaha, R.K.S. (Ed.). Scientific Publishers (India), Jodhpur, India, ISBN: 8172333382, pp: 431-470. Kues, U., P.J. Walser, M.J. Klaus and M. Aebi, 2002. Influence of activated A and B mating-type pathways on developmental processes in the basidiomycete Coprinus cinereus. Mol. Genet. Genomics., 268: 262-271. Kues, U., T. James, R. Vilgalys and M.P. Challen, 2001. The chromosomal region is containing pab-1, mip and the A mating type locus of the secondarily homothallic homobasidiomycete Coprinus bilanatus. Curr. Genet., 39: 16-24. Li, L., E.E. Gerecke and M.E. Zolan, 1999. Homolog pairing and meiotic progression in Coprinus cinereus. Chromosoma, 108: 384-392. Liu, Y., J.D. Granado, E. Polak and U. Kues, 1999. Crosses with Amut Bmut homokaryons of Coprinus cinereus. Fungal Genet. Newsl., 46: 16-20. Liu, Y., P. Srivilai, S. Loos, M. Aebi and U. Kues, 2006. An essential gene for fruiting body initiation in the basidiomycete Coprinopsis cinerea is homologous to bacterial cyclopropane fatty acid synthase genes. Genetics, 172: 873-884. Martin, A.W., C. Villalba, R.M. Buser, A. Grunler, M. Aebi and M. Kunzler, 2006. Targeted gene silencing in the model mushroom Coprinopsis cinerea (Coprinus cinereus) by expression of homologous hairpin RNAs. Eukaryotic Cell, 5: 732-744. Moore, D., 1981. Developmental genetics of Coprinus cinereus: Genetic evidence that carpophores and sclerotia share a common pathway of initiation. Curr. Genet., 3: 247-254. Moore, D., 1998. Fungal Morphogeneis. Cambridge University Press, Cambridge, UK., ISBN: 0-521-55295-8, pp: 485. Muraguchi, H. and T. Kamada, 2000. A mutation in the eln2 gene encoding a cytochrome P450 of Coprinus cinereus affects mushroom morphogenesis. Fungal Genet. Biol., 29: 49-59. Muraguchi, H., T. Fujita, Y. Kishibe, K. Konno and N. Ueda et al., 2008. The exp1 gene essential for pileus expansion and autolysis of the inky cap mushroom Coprinopsis cinerea (Coprinus cinereus) encodes an HMG protein. Fungal Genet. Biol., 45: 890-896. Muraguchi, H., T. Takemaru and T. Kamada, 1999. Isolation and characterization of developmental variants in fruiting using a homokaryotic fruiting strain of Coprinus cinereus. Mycoscience, 40: 227-235. Muraguchi, H., Y. Ito, T. Kamada and S.O. Yanagi, 2003. A linkage map of the basidiomycete Coprinus cinereus based on random amplified polymorphic DNAs and restriction fragment length polymorphisms. Fungal Genet. Biol., 240: 93-102. Muraguchi, M. and T. Kamada, 1998. The ich1 gene of the mushroom Coprinus cinereus is essential for pileus formation in fruiting. Development, 125: 3133-3141. Murata, Y., M. Fujii, M.E. Zolan and T. Kamada, 1998. Molecular analysis of pcc1, a gene that leads to A-regulated sexual morphogenesis in Coprinus cinereus. Genetics, 149: 1753-1761. Murata, Y., M. Fujii, M.E. Zolan and T. Kamada, 1998. Mutations in clamp-cell formation, the A-regulated sexual morphogenesis, in homobasidiomycetes. Proceedings of the 4th Meeting on the Genetics and Cellular Biology of Basidiomycetes, Mushroom Experimental Station, March 27-30, 1998, Horst, The Netherlands, pp: 143-146. Mutasa, E.S., A.M. Tymon, B. Giittgens, F.M. Mellon, P.F.R. Little and L.A. Casselton, 1990. Molecular organization of an A-mating type factor of the basidiomycete fungus Coprinus cinereus. Curr. Genet., 18: 223-229. O'Shea, S.F., P.T. Chaure, J.R. Halsall, N.S. Olesnicky, A. Leibbrandt, I.E. Connerton and L.A. Casselton, 1998. A large pheromone and receptor gene complex determines multiple B mating type specificities in Coprinus cinereus. Genetics, 148: 1081-1090. Pardo, E.H., S.F. O'Shea and L.A. Casselton, 1996. Multiple versions of the A mating type locus of Coprinus cinereus are generated by three paralogous pairs of multiallelic homeobox genes. Genetics, 144: 87-94. Polak, E., R. Hermann, U. Kues and M. Aebi, 1997. Asexual sporulation in Coprinus cinereus: Structure and development of oidiophores and oidia in an Amut bmuthomokaryon. Fungal Genet. Biol., 22: 112-126. Pukkila, P.J., 1993. Methods of Genetic Manipulation in Coprinus cinereus. In: Genetics and Breeding of Edible Mushrooms, Chang, S.T., J.A. Buswell, P.G. Miles (Eds.). Gordon and Breach Science Publishers, Switzerland, ISBN: 2-88124-561-7, pp: 249-264. Pukkila, P.J., 1996. Production and Analysis of Meiotic Mutants in Coprinus cinereus. In: Fungal Genetics: Principles and Practice, Bos, C.J. (Ed.). Marcel Dekker, Inc., New York, ISBN: 0-8247-9544-X, pp: 363-370. Redhead, S.A., R. Vilgalys, J.M. Moncalvo, J. Johnson and J.S. Hopple, 2001. Coprinus Pers. and the disposition of Coprinus species sensu lato. Taxon, 50: 203-241. Riquelme, M., M.P. Challen, L.A. Casselton and A.J. Brown, 2005. The origin of multiple B mating specificities in Coprinus cinereus. Genetics, 170: 1105-1119. Sano, H., T. Narikiyo, S. Kaneko, T. Yamazaki and K. Shishido, 2007. Sequence analysis and expression of a blue-light photoreceptor gene, Le.phrA from the basidiomycetous mushroom Lentinula edodes. Biosci. Biotechnol. Biochem., 71: 2206-2213. Srivilai, P., P. Loutchanwoot and J. Sukha, 2009. Blue light signaling inactivates the mating type genes-mediated repression of asexual spore production in the higher basidiomycete Coprinopsis cinerea. Pak. J. Biol. Sci., 12: 110-118. Srivilai, P., W. Chaisaena and U. Kues, 2005. Genetic Analysis of Coprinopsis Cinerea Mutants with Defects in Fruiting Body Development. In: VI Genetics and Cellular Biology of Basidiomycetes, Pisabarro, G. and L. Ramirez (Eds.). University of Publica de Navarra, Pamplona, Spain, ISBN: 8-497-69107-5, pp: 177-190. Swamy, S., I. Uno and T. Ishikawa, 1984. Morphogenetic effects of mutations at the A and B incompatibility factors in Coprinus cinereus. J. Gen. Microbiol., 130: 3219-3224. Takemaru, T. and T. Kamada, 1972. Basidiocarp development in Coprinus macrorhizus: Induction of developmental variations. Bot. Mag. Tokyo, 85: 51-57. Terashima, K., K. Yuki, H. Muraguchi, M. Akiyama and T. Kamada, 2005. The dst1 gene involved in mushroom photomorphogenesis of Coprinus cinereus encodes a putative photoreceptor for blue light. Genetics, 171: 101-108. Tymon, A.M., U. Kues, W.V.J. Richardson and L.A. Casselton, 1992. A fungal mating type protein that regulates sexual and asexual development contains a POU-related domain. EMBO J., 11: 1805-1813. Uno, I. and T. Ishikawa, 1971. Chemical and genetical control of induction of monokaryotic fruiting bodies in Coprinus macrorhizus. Mol. Gen. Genet., 113: 228-239. Walser, P.J., M. Hollenstein, M.J. Klaus and U. Kues, 2001. Genetic Analysis of Basidiomycete Fungi. In: Molecular and Cell Biology of Filamentous Fungi: A Practical Approach, Talbot, N.J. (Eds.). Oxford University Press Inc., New York, ISBN: 0-19-963838-1, pp: 59-90. Walser, P.J., R. Velagapudi, M. Aebi and U. Kues, 2003. Extracellular matrix proteins in mushroom development. Recent Res. Dev. Microbiol., 7: 381-415. Waters, H., D. Moore and R.D. Butler, 1975. Structure of aerial and submerged sclerotia of Coprinus lagopus. New Phytol., 74: 199-205. Zolan, M.E., N.K. Heyler and N.Y. Stassen, 1994. Inheritance of chromosome-length polymorphisms in Coprinus cinereus. Genetics, 137: 87-94.